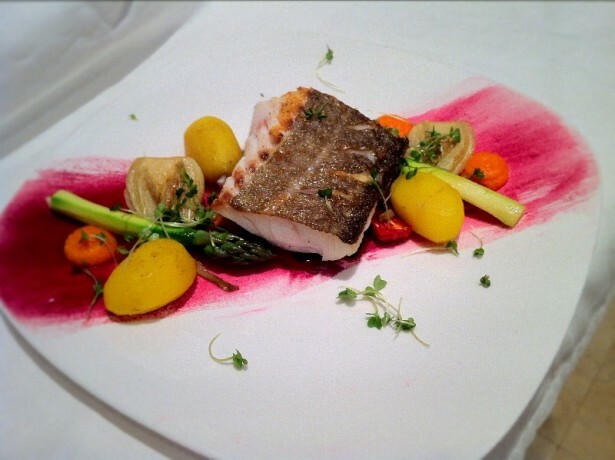 This fish dish is from a Welshman called David Kelman of Ellenborough Park. He is competing in this years Great British Menu on BBC2. For those abroad and not aware of this competition, each year a theme is created which the chefs must design their dishes around. Three chefs from each UK region compete in a regional heat, the winner is then put against all the other 7 winners and the four dishes are chosen. A final banquet is then served with the winning dishes. This year the theme is to celebrate the 70th Anniversary of D-Day landings and will be held at St Paul’s Cathedral. The chefs need to design a four course menu. I was asked if I would like to re-create two of these dishes and share with the public. Here is the first dish. Some of the programmes I have watched really are at the cutting edge of technology using appliances only seen in science labs. Good news with this dish, is that it is all straight forward cooking. The hardest part is finding beetroot powder. The theme is to create dishes that will be nostalgic with the war veterans, yet modern enough to grace any menu. The only extravagance on this plate was cooking the potatoes in saffron water. After that, all the parts are just humble vegetables we can easily get a hold of. I can’t recommend this dish enough, there is a lot of last minute cooking to get all the constituents to come together. However, once they’re on the plate, a superb dinner will be had by all. The beetroot powder is a revelation, extremely sweet but not in a sugary/dessert way. It compliments everything on the dish. I’m sure David will score well with dish. It tastes superb and it’s simplicity will probably go down well with the older generation of veterans. I look forward to the week beginning 26th May when he is on BBC2. Prepare the cod, lightly salt it and wrap in clingfilm. Place in fridge for 6 hours. After this time remove, wash off salt and cut into four portions. For the tomato dressing, warm the oil with the sliced garlic clove. Let it infuse for 10 minutes. Add the tomatoes to a blender and slowly add the oil with the machine on. It will emulsify as you do this. For the saffron potatoes, add them to a pan of salted water with the garlic and saffron. Boil until soft. Chill until needed. For the baby plum tomatoes, slice in half, put on a baking tray and place in a low oven for 6 hours. To cook the cod, place the cod skin side down in a pan and cook over a high heat until the edges begin to brown. At this point, turn the heat down to low and cook for five minutes. Turn the fish and cook on the other side for a further five minutes on low heat. Brush a plate with butter and sprinkle the beetroot powder over the plate, shake off any excess. Wilt the spinach in a pan with a knob of butter and seasoning. Cook the fennel bulbs cut side down until they colour. Reheat the potatoes. Cook the asparagus in butter only for 2-3 minutes until it softens. To serve, place some spinach in the middle of the plate, add the cod on top. Decorate the plate with the vegetables and add the tomato dressing where you see fit. I’ve never heard of beet root powder, where did you source it? I wonder if you can use a puréed roasted beat root smear instead of the butter and beetroot powder…would the flavour profile be similar enough? The colour is spectacular. The dish looks beautiful and I’m sure it will score high marks. Hi Eva, you should be able to source in health food shops. It really is unique and delicious. Failing finding it, if you make a purée, I would reduce it by half then use it. Love the beetroot powder! Such a lovely colour! The whole dish is beautiful and I’m sure David will do really well. What a lovely dish…I love all the vegetables served with it. I was wondering, is salting the fish and leaving for 6 hours for taste or texture? Hi Karen, it’s essentially for both. Just use normal fine table salt, not sea salt. It slightly firms up the fish so it holds it shape better once cooked. Rather than flaking apart all over the place. I’ve never seen beetroot powder. I wonder if you could slice and dry it and then grind it up? Terrific meal – again. Beautifully plated. I think they probably put it through a dehydrator and then blitz it. If you can dry things at home I’m sure it’ll work. Otherwise look at health food stores, you should find it there.